Get exclusive training content on your mobile device that will help you improve your auscultation skills and use your stethoscope more effectively. Purchasers will receive an email with details. High acoustic sensitivity makes the 3M Littmann Classic III™ 27" Monitoring Stethoscope ideal for any clinician. Superior construction and tunable diaphragms offer durability and versatility. This product can be shipped anywhere in the 50 United States, Puerto Rico, The US Virgin Islands and APO and FPO addresses. Sorry, we cannot ship this product to any other address. This is my second stethoscope. My first was when I started medical school. Now I’m graduating and will be starting residency as a doctor! I was excited to have it engraved with my degree. The engraving looked terrible, blurry, and very small. The first one was so much better and I’m not sure why the quality would go down. Super disappointed. Love, Love my burgundy/ champagne stethoscope. I can hear everything great for listening to the heart and different murmurs.The champagne bell is perfect and highly sophisticated look. I was really disappointed in my new stethoscope!! I am unable to hear any sounds. Now I am hard of hearing, but I had a coworker used it and she said it was hard for her to hear as well. Not sure what type or brand I need to look into. Just recieved this by mail today ! shipping was very fast and was packed nicely. Had this engraved for a friend and its looks amazing very happy with this product ! I think the all black really shows the name engraved..Thank you again I am sure this will be a great gift ! I got this after the tubing cracked in my old Littmann that I'd had for years. I loved the color, and had loved the one I previously owned. The tubing in this one is thicker than the Classic II, but pretty flexible. It's not super heavy and stands up to my everyday use. I work in Cardiac Rehab so I need a reliable stethoscope & light weight is better for my long days. The newer ones my Co Workers have bought are heavier than I like. Price sealed the choice. I gave this as a gift to a very deserving medical professional. Aside from the long wait for it's arrival, it is a wonderful product and beautiful as well. I like it. It is what I wanted when I ordered it. Great stethoscope and the color is accurate, however the color used for the engraving is so light, you can barely see the name. After calling customer service, I was told it was a standard color for the engraving. Perhaps All-Heart should pick a darker color for engraving light colored stethoscopes. I’ve had a classic Littmann before but unfortunately left it in the heat during the summer and have been searching for a new affordable stethoscope. I decided to go with the classic again. I work in an OBGYN office, and I hear perfectly with this stethoscope. I got the lime green. It’s gorgeous! PERFECT! The girlfriend love's it and will buy more later in the future! Great stethoscope and the engraving was perfect. Service was fast too. It got here more quickly than anticipated. Nice stethoscope for the money. Will use it for a long time. Good quality and the sound is great. So far the stethoscope has worked great. The only downfall is the engraving. You pay a decent amount of money to have an engraving (in this case my name) and it is so small that barely anyone could read it. You have to look very close and under the perfect lighting to know what it says. Disappointed that it cost that much extra for something that I can barely read. I got this for my girlfriend for Christmas and she absolutely loves it. I got n n it engraved with her name on the tube and on the head. Both exactly as I imagined it would. Couldn't be happier! The rainbow plating starts to turn silver with time. I bought the raspberry with rainbow finish stethoscope for my daughter. I love the stethoscope, however, I also had the engraving done on it. HUGE mistake to pay the xtra money for it. So NOT worth it, you CANNOT see it nor read it you DONT even know its there unless you point it out. The stethoscope, however, is a nice quality. I was conflicted with how many stars to give the product, since the engraving was such a HUGE DISAPPOINTMENT. I purchase this for my daughter and she absolutely loved it. I love the oil slick color I purchased. Its unique and works great . Love this stethoscope ! So well made, got the chocolate and copper and personalized. Love the color and finish but my name on it is very small and a little difficult to read. Got the rose gold charm on it and it is perfect. I would recommend this stethoscope to anyone. For nearly a decade I had been using my Pretige Medical Sprague Rappaport Stethoscope. I always had difficulties identifying adventitious breath sounds and extra heart sounds in school, but since my job as an LVN in a clinic didn’t require me to use a stethoscope I didn’t think much of it. Now I am in a BSN program and it was time for an upgrade and Littmann did not disappoint. Not only is it stylish, mine has the black tubing and rainbow finish, but I can hear everything so clearly! I can easily identify murmurs, extra heart sounds, bruits, and adventitious lung sounds. The only thing I would point out is engraving, if you get the rainbow finish it will be difficult to see your name engraving so I would suggest that you still label your stethoscope in some other way so that it doesn’t get lost. I will definitely continue to use Littmann and recommend it to my colleagues. I love it so much! It was a bit pricey but so worth it. It is of great quality material. The color I got it in is chocolate w/copper finish and I have been getting nonstop compliments from both staff and patients of how beautiful and very elegant it looks and it is not a a common color to see. I could have not asked for anything better, really exceeded my expectations. Will highly recommend!!! I ordered the all black with the rainbow head and it’s beautful! I’ve received so many compliments already! I’ve compared it to the my school issued stethoscopes and my littmann blows them away! So glad I purchased this! EMT Basic, love the classic III, I’m able to hear perfectly in the back of the truck where as my last stethoscope barely anything was audible. Definitely a recommendation from me!! Came just in time! I highly recommend getting your stethoscope engraved if you are a student. These things are expensive and personally I would not like to have it stolen by another student who claims that it was theirs all along. Also if it were to get lost, you can easily find it amongst other stethoscopes that may be lost as well especially if there are multiple of the same color! I can hear everything so much more clearly. Love my new stethoscope! Liked it so well I bought one for my son too! Got the lemon lime stethoscope engraved. Turned out perfect. Works great! I love my stethoscope, The sound quality is loud and clear, and I had mine personalized and it turned out great! Love love love this stethoscope! I love it! Very clear sound, durable, and beautiful! It was a gift for a nurse graduate and she loved it. I'm a nurse who got this for my faudaugh who is just starting nursing school. Got it engraved with her name, will go with all her outfits, and will be used by her for many years. She says it's beautiful. Love my Littman, unfortunately after about 3 years the tubing literally broke in half and the bell covers won't stay on. So now I have to buy me another one. The color of the tubing is beautiful and they did a wonderful job etching my name into the head. I’m thrilled with the craftsmanship of the product, but I may be listening wrong with them, because I find it difficult to hear some heartbeats over others and I’m not sure why. This is my second Littman. Someone walked off with my first one at work, and it was engraved. So, I had a cheap stethoscope which did not cut it... Had to have my Littman!!! I Love IT!! It's perfect, I can hear everything I need to. Will always have one. The quality is superb!! I only give it 4 stars because of the brand and quality of the actual stethoscope. The mirror finish looks nothing like the picture online. It is dull and not reflective. Extremely disappointed I paid extra for it. I can barely see my name on the stethoscope. I wish they would have used a different color for it or something. I love the color !!! Great acoustics. I love Litman just disappointed in the quality of the customizations! Should have bought a basic stethoscope. Bought this for myself as an upgrade from the lightweight littmann and already I am in love with it. I had the bell engraved and the engraving was done perfectly. I have used this to listen to my children's heart and lung sounds and I can not believe the amplification. I can't wait to use this at work. Bought it for a friend's daughter for her graduation and she loved it. I'm so proud of her she wants to be a nurse anesthetists. She will forever cherish it. Thank you soo much. Quality product, quality engraving, and timely turn time from order to delivery! Shipped to me in less than a week. I'm completely satisfied with the ordering process and the item itself. Thank you. I like the color I’m just upset about the clairity of the font. It could have been more visible and the quote I put on there could have been in a different color “like black”. I spent extra money for nothing. Thank you. I needed an updated Stethoscope and this one worked perfectly. Perfect size and vibrant color. Loved the engraving also. Such cute color so perfect!!! I purchased the ceil blue to match my nursing uniform which is white and ceil blue and I love how it goes together. The stethoscope is amazing quality compared to other brands. I also got my name on the bell and this prevents the chances of someone stealing my stethoscope! Would highly recommend it. A stethoscope is going to be an investment since is so pricey, but you will use it everyday. I ordered this stethoscope for nursing school. It works well, however, I was a little disappointed when I discovered the tubing was different than illustrated in the picture. It is somewhat matte or rough instead of smooth and shiny. The tube personalization is also a little sloppy. It might be due to the texture of the tubing. This was purchased for my daughter who will be starting PA school next year and she needed one to start working her EMT job until she starts. She loves the quality and sound reproduction of this version. I used the same one many years ago during my first years of medical school. Bought this online for my first semester in nursing school starting soon because of all of the recommendations on it and it arrived actually two days sooner than all heart even expected which was amazing. Color is pretty accurate compared to photo; only thing I can't give it 5 stars for is that the "Caribbean Blue" color is shown in two different tints online. If you click on the one with the standard stainless color it looks a lot darker compared to the black/rainbow versions. Because of this I wasn't sure which color it would be but I still like it. It's worth spending the extra money getting it engraved so that no one can accidentally walk away with your scope without being caught. It works great.Sound is good. You can hear very well. Love the color of it too. I love my new stethoscope. It's pretty but I am having a hard time hearing with it. I hope it gets better with more use. Best stethoscope I have owned. received my stethoscope when it said i would. i ordered it in plum and the color is true to the website color. i can hear out of it perfect and cant wait to use it in my nursing career!! No problems here, exactly what I expected. I got mine personalized and it came out great. Love the color choices and finish options! Received it when it said I would. 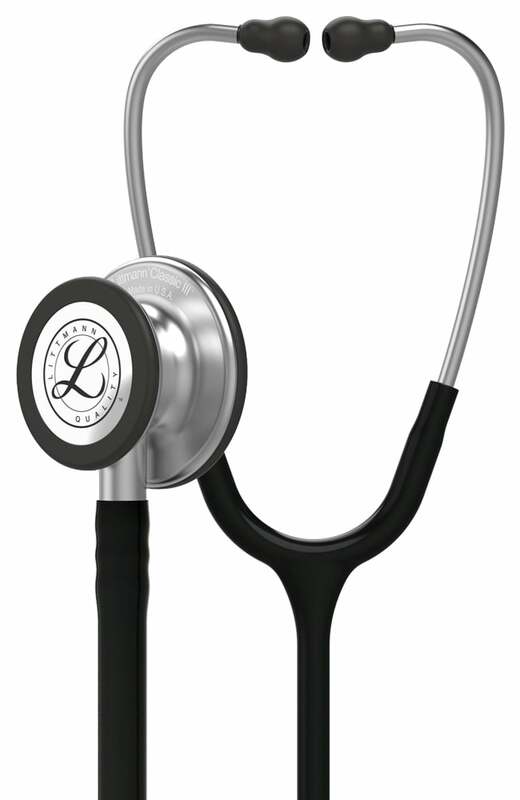 The stethoscope itself is typical of Littmann high quality standards, you get what you pay for and this is a great buy. This is an amazing product and i am very happy with it. Highly recommended and the engraving was worth the price. I bought this for my daughter she loves it!!!! The product was exactly as expected. However, we felt the personalization was miniscule. I love this stethoscope. It's my first one and it took me some time. All I can say that I'm pride to be able to carry one and treat my patients accordly. I received this as a gift when I graduated from nursing school. I had it engraved and glad I did because some believe that they can just use it and not return it. I love it. The color choices offered are great as well but my gift giver knows me well and chose the color I love most. There is no comparison to the quality of this scope! I recommend this to any nurse that is looking for a good quality stethoscope. I love my new stethoscope. I've been an RN for 23 years and have only owned Littmann stethoscopes the whole time. Nothing beats the quality and durability of a Littmann. They were the first to have those wonderfully soft earpieces. After my older Classic II was stolen at work, I decided to move up a little. I ordered the magenta with the gold metal tubing and rainbow bell Classic III. I also had the tubing & bell engraved. The writing on the bell is a little hard to see, but it's fine. The sound quality is so much better than my II. I love my new pretty stethoscope! When I opened the box I was so excited! The Stethscope was exactly the colors that my Granddaughter designed! She was accepted into a College nursing program and this is a special gift for her! Was very disappointed in the quality of the custom engraving. So small it wasn't legible. This stethoscope brand is amazing. I don't use anything besides the cardiology 3. However, I ordered this stethoscope as a graduation gift for a friend son a month ago and have yet to receive it. I got the email to review it before the stethoscope even arrived....that's odd!!! I love my latest purchase. My Littmann stethoscope!! It's unique in color and everyone at my job is interested in getting one!! Very pleased with the quality of the product and the time it took to get it. This stethoscope is great! It works very well. The only complaint I have is the littman pieces on both sides fall off and I have to keep reordering the pieces at $20 a piece. They shouldn't fall off so easy. I bought this product and it was a beauty at first sight. I bought the magenta and gold rainbow custom design, sound is so clear and can pick up very low pitch sounds that my old stethoscope could not. I love it!!!! The design is unique, and I get lots of compliments and overall it's great while doing my work. The only fault is that the color of the tubing stains easily Ian not sure if it's because of the friction of the tubing against itself but I no longer throe it into my bag thank goodness I kept the original box this is where I keep it when it's not around my neck. Very nice color and the engraving turned out very nice and the writing is very legible. Extremely happy with Littmann stethoscope. I love the stethoscope's ability-yes. What I did not expect was to get such a dark green color on the tubing. I did pay extra to get the Aruba-blue color with a rainbow bell. I got the rainbow bell but the tubing is not blue-it's Cadillac green. That was disappointing. I almost sent it back but didn't because I need a stethoscope right now for my patients. I'm a vet tech, so my patients drool, wiggle, pant, and bite. I'm able to get a quick clear sounding heart rate, and it stays pretty clean. When I need to wash, I don't have to worry about something falling off. Durable. I bought these products for my daughter. She is taking classes in nursing. Looks good and my wife loves its. Got it for her because she needed a replacement and I like the fact you can pick the color you want. I bought this as a Christmas gift for my daughter who is an ER nurse. I had it engraved with her initials and a one word inspiration. She loved it. She also mentioned that it was so much clearer to hear than her last one she is amazed, and we spent even more for that one. My daughter in law got it for Christmas and she really liked it. She tested on all her children and checked the mother goats for 4-H . She is really impressed with the quality. Having her name on it will add to the security of always finding her own and using her own Stehoscope. Great gift for that future dr! I bought this for a sister of mine as a Christmas present that just got accepted into med school. She absolutely loved it and the engraving looks beautiful! The color was true to the website color, as well as the engraving color. I was happy with the purchase. The only problem is that I paid for wrapping and did not receive it. Nothing but the best, for their customers! I ordered a stethoscope for my daughter for nursing school the end of November, got my tracking number, and about the middle of December learned that FedEx picked up my package and in turn, turned around and just dropped in a USPS. This is the new normal for FedEx, no matter the amount we pay, or don't pay when free. The company stepped up made another one and had it sent to me in time for Christmas. Thank you for all your wonderful employees and for all you do for your customers. Thank you! This is my first stethoscope, as I recently finished a class to become a Nurse Aide, and plan to pursue Nursing. I wanted to invest in a great tool, and I must say, I love it! The rainbow finish is a fun touch, and the quality is everything I hoped for in a Littman. I bought this stethoscope after owning the lightweight SE for awhile. I couldn't hear anything other then a faint heartbeat with the lightweight but this is completely night and day. I can hear everything I need to as a nursing student. Great purchase. I needed a good stethoscope for nursing school and it was between this one, the classic ii SE and the Cardiology. Well I went with my gut on this one and just bought the classic III and may buy the Cardiology when I need one that pricy and good. I was pretty nervous at first to order this stethoscope because it is fairly new still and doesn't have many reviews on it while the classic II, everyone said was great. And in order for me to buy something over the internet, I have to read every review before buying it. I read some reviews that said the head piece keeps slipping off, you can barely hear through it, the ear pieces are uncomfortable, the tubing material feels cheap and so on. Well my head piece is certainly not coming off very easily as I tried to pull it out without breaking it, the material feels very heavy duty, the sound quality is truly amazing and the ear pieces are fine. I'v tested the adult size and the pediatric side on my one year old and can hear everything pretty good! I'v never used the classic II or even a cardiology but I know this is WAY better than the cheapo one that I have to backup if I ever loose my good one (which will not ever have it leave my hands LOL). Also, I know a few people that say they can't really hear out of their Classic SE ii personally so I am more than happy with my new purchase and can not wait to put it to use! Excellent Stethoscope! Littmann Delivers Again! This is an excellent stethoscope with great acoustics. Littmann once again has delivered an amazing product. I would even go as far as saying that this stethoscope is a huge improvement over its predecessor, the Classic II SE. I would definitely suggest this to other healthcare providers. A very nice stethoscope !! Much better acoustics than my old Classic 2 SE- but of course it is 30 years old. I am very happy with it, the newer tubing etc. For the price, an excellent diagnostic value !! Really good scope; not quite as good as the Cardiology III, but close, so great for everyday general use. I wish it was available in gray tubing.